Ktrak Cycle Corp. is thrilled to announce the retail release of its innovative bike kit to the worldwide outdoor sports marketplace. 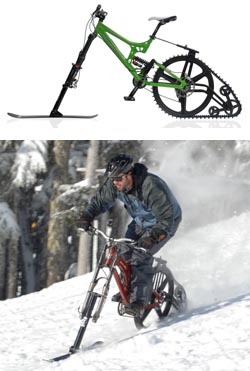 Just in time for the '07/08 Winter Season, the rear-drive track system creates a world of winter biking opportunities. Fresh and groomed snow showcase the track's unique design, providing approximately 25 times the traction and flotation of the average mountain bike wheel  and when coupled with Ktrak's optional front ski attachment, cross-country and downhill prospects are endless. Ktrak's first Prototype units were introduced to much fanfair at the largest North American bike show, Interbike, in September 2006. This was followed up by a phenomenal response to the introduction of our first production units at the Eurobike show in Germany in August 2007. Its unique patented design is creating a buzz in the sporting community, as bike enthusiasts envision the cross-season opportunities made possible with Ktrak. The Ktrak kit is constructed of quality materials and exceptional workmanship with durability and precision in mind. Universal to almost all makes and models of mountain bikes, the kit is currently available for a 26" wheel, and will be made available in 20" and 24" models later in 2008. The Ktrak system can be purchased directly through our website at www.ktrakcycle.com. Beginning later this month, Ktrak will be available through approved dealers throughout North America and abroad. For further product information, including technical data, photos and video stream of the Ktrak in action, feel free to contact us at the email above or visit www.ktrakcycle.com. Media-specific high resolution photos and video are also available upon request at www.ktrakcycle.com.